Recladding your industrial shed or warehouse is a great and cost effective way to extend its lifespan. There are some factors to consider when looking at hiring commercial roofers for this type of project, including the scope of work, whether you’ll be replacing “like for like” or upgrading or refurbishing the building, and whether your business will be able to run as normal during the works. 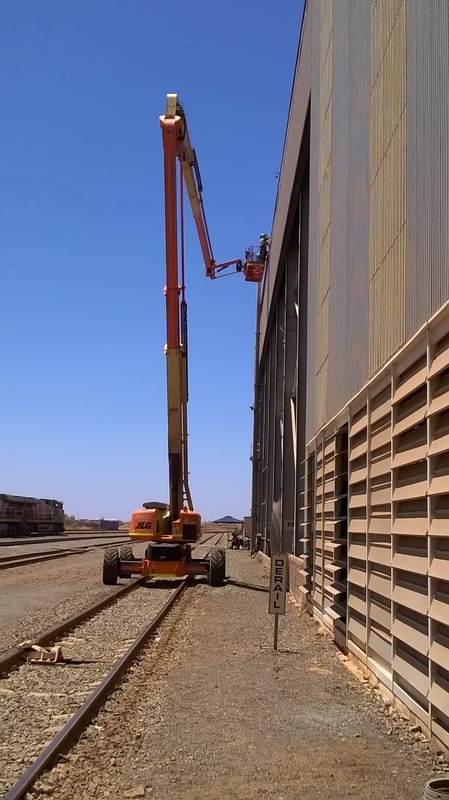 Most commercial roofers have experience with re-cladding projects for sheds or warehouses because removing and replacing old cladding or weather-damaged materials and structures are essential and fundamental tasks in the industry. Cladding provides a non-loadbearing waterproof outer layer for a building, and can include the “skin” of the walls and the roof. Unlike residential buildings that can be clad in any number of materials, generally industrial buildings are clad in galvanised steel or aluminium sheeting, providing a long-lasting and weather resistant finish to a warehouse, factory or shed. Because of its low maintenance and high levels of durability, steel is well suited for use in most parts of Australia, and particularly in regions of Western Australia where the climate can be harsh and unforgiving. The professional installation of new cladding can help to reduce energy costs and the environmental impact of the building in its surroundings as well as have a direct impact on other important factors such as sound insulation, ventilation, drainage and fire resistance. Steel is also reusable and 100% recyclable. A full replacement of cladding can also act as a “makeover” for an older or knocked-about industrial building, and it is often among the very first things a commercial roofer will suggest when recommending ways to enhance the existing structure or make it more aesthetically pleasing. Professional grade steel cladding nowadays comes in a variety of styles, with different colours or reflective finishes, and these can be combined with any number of advanced guttering and drainage systems to provide a totally different look for your building. If you are considering a refurbishment of your industrial warehouse or shed, you’ll need to decide whether to keep the project simple and have the existing cladding replaced with a similar design and materials or whether you wish to update and even add on to the structure. For example, you may wish to think about having an advanced ventilation system or skylights installed during the project, or removing or adding doors or windows to the warehouse. Any additional construction or building projects will naturally need to be added to the timeframe for the project plan as well as the overall cost. Commercial roofers are often asked by clients to minimise the downtime for their business during a warehouse or shed re-cladding project. Some jobs might only take a few days or a week, however bigger projects can sometimes be undertaken over a number of months and involve many contractors on-site. Only professional, experienced roofers such as PRC Building Services will be able to ensure that the project is designed, organised and managed so that you experience minimal disruption to your workforce and your business.